Educational Destinations LLC (“ED®”) respects your privacy. ED® will not sell or give away individual personal information to anyone without your permission, unless so ordered by a court of law, or unless so requested by legitimate government or law enforcement agencies. ED® will cooperate with law enforcement agencies to identify those who use its services to further illegal activity. Otherwise, the information you submit to us is only available to our employees for purposes of managing your travel arrangements or payment and information requests. Information shall also be available to contracted service providers supplying services relating to your travel arrangements (airlines, cruise lines, etc.). If you browse the Company's website, you may generally do so anonymously without providing any personal information. However, there are cases where we may ask you for personal data. For example, in order to sign up for online trip registration and payment you will be prompted for your name, e-mail address, phone number, and mailing address. You are also asked to select a password to protect your personal information. If you choose not to give the information we request, you may still visit the public portion of the Company's website, but you will be unable to register for trips and take advantage of the online payment features. In case you change your mind or wish to update or delete personal information (such as your zip code), we will endeavor to correct, update or remove the personal data you give us. You can do this by contacting our Customer Support organization at the contact points specified below. When you make an online payment for a trip, you will be prompted for your credit card number, expiration date, and card verification code in order to complete the transaction. This information is required so that we can process and fulfill your payment, send a confirmation, as well as notify you of your payment status. All Internet transactions with the Company are performed on a secure server that encrypts your credit card information to ensure it is not read by unauthorized third parties. Personal information provided by users who are 13 years of age or over will be used for marketing and promotional purposes only by the Company and its subsidiaries and affiliates. The Company does not rent, sell or otherwise distribute to third parties your personal information entered on this site. While we use all reasonable efforts to safeguard the confidentiality of your information, the Company will have no liability for disclosure of any information obtained due to errors in transmission or the unauthorized acts of third parties. The Company also reserves the right to change or update this policy, or any other policy or practice, at any time, with reasonable notice to users of its website. Any changes or updates will be effective immediately upon posting to our site. We may share statistical or aggregated non-personal information about our users with advertisers, business partners, sponsors and other third parties. This data is used to customize the Company's website content and advertising to deliver a better experience to our users. This site uses "cookies" for site administration purposes. If you set up your browser to not accept cookies, parts of the site may be rendered unusable. In order to register for trips and take advantage of the online payment functionality, you will need to keep cookies enabled in your web browser. The Company's website also may detect and use your IP address or domain name for internal traffic monitoring and capacity purposes or to otherwise administer our website. No personal information is obtained, rather just the patterns of usage of our various users may be tracked to provide you with improved service and content based on aggregate or statistical reviews of user site traffic patterns. The Company reserves the right to disclose user information in special cases, when we have reason to believe that disclosing this information is necessary to identify, contact or bring legal action against someone who may be causing injury to or interference with (either intentionally or unintentionally) our rights or property, other Company website users, or anyone else that could be harmed by such activities. We may disclose personal information without notice to you in response to a subpoena or when we believe in good faith that the law requires it or to respond to an emergency situation. The Company does not knowingly collect or use any personal information from users under 13 years of age. Please be advised that our website contains links to third-party websites. The linked sites are not under the control of the Company, and we are not responsible for the contents or privacy practices of any linked site or any link on a linked site. Monday - Friday 8:00am - 4:30pm EST/EDT. Get tips, tools, and resources that enable you to jump-start a travel program for students who never thought they’d never travel outside their state or country. Get advice from ED’s professional staff, its partners, and more. 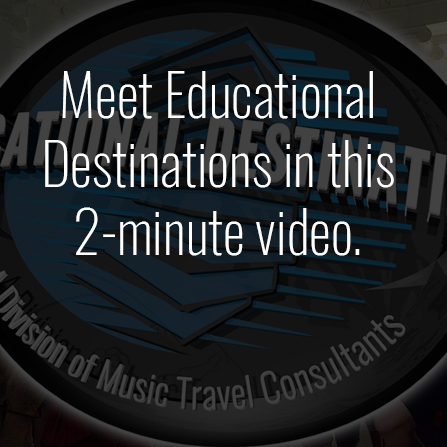 Educational Destinations wants you to get the most out of your total travel experience. That’s our commitment to you and to your community. Can't find what you are looking for? Please call us toll free during office hours at 800.616.1112 or email us.